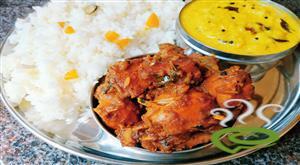 Chicken Achari is a spicy chicken dish prepared in mustard oil with whole spices. Preparation method is very similar to making pickles. 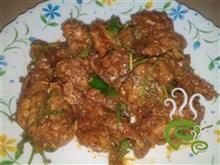 This achari dish is very delicious and flavorful, it goes very well with roti or rice. 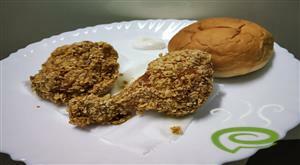 Try this easy recipe and share your comments. Please check out the 1 minute video of this recipe. Heat mustard oil, till it smokes. Remove from fire and allow it to cool. Add all the spices and fry for 1/2 a minute, till the fenugreek seeds turn golden brown. Add onions and fry, till they turn golden brown. Add ginger-garlic paste and fry for 1 - 2 mins. 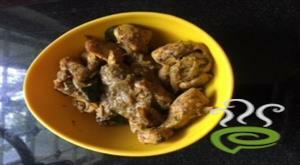 Add chicken, salt, turmeric powder, sugar and red chilly powder and fry for 3 - 4 mins on a high flame. Add curd and keep stirring, till it boils. Stir for another 2 mins. Lower the flaame, cover and cook for 12 - 15 mins or till chicken is tender. Allow 1 - 2 boils. Add 1/4 cup of water, if desired and give another 2 - 3 boils. 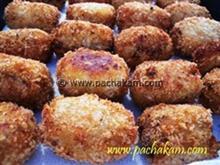 :- Paneer or Dum aloo made in this way is also very delicious. Wow the curry was awesome...just that i made a few changes..i added green chilles to make the dish even spicier and added capsicums too...it tasted great,the curry tasted good with chapathi as well as puttu.Try it folks...its a dish worth trying. I tried it,it was good.I didnt have mustard oil so used achaar ka oil.Will mustard oil make a difference? My husband loved it. Kalonji is also called nigella or onion seeds. it looks fine black gravel and is nit the same as shah jeera or caraway. Kalaunji is Black Caraway Seeds or Sajeerakam in malayalam or black cumin seeds. Hope that helps! To Be Frank The Dish Taste"s Very Good, But Still TRUPTI has not Come Forward To Explain Or To Define What Kalunji is, Inspite Of Various Food Lovers Has Requested For,Hope We Can Expect It In Glossary Category Very Soon. 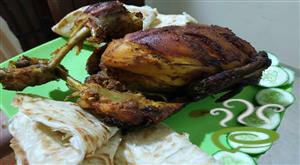 wonderful recipe....must try....easy n yummy too! Thanks Trupti, just a question, were u from mount carmels-bangalore????? really yummy. I did not have mustard oil or mustard seeds so I used a bit of achar ka tael instead. I didn`t know what kalaunji was and made achari without it...even then it came out excellent.My husband liked it very much. this recipe was excellent. i never knew it would turn out so well. the only thing i did different was i cooked it in ghee because i didnt have mustard oil and yet it came out so well.both me and my husband enjoyed it.i have made a note of it as well in my recipe book. thanks so much! just love it !! its awseome... thanks trupti! This recipe tastes better than it sounds. A must try. Excellent recipe. Thanks Trupti. What is Kalonji called in Malayalam? What is onion seeds? What is it called in Malayalam? i couldn`t believe at first this could taste so good ...u have to try it 2 believe it ...everyone was all praises for this dish ..thanks a zillion trupti . it turned out too good ...its so easy to make & tastes as good as well ...excellent for beginners like me . i got compliments from everyone for this dish...i think i`ll keep this item as a regular part of my menu now ..thank u so much trupti for the gr8 recipe .